Thursday Musical’s Music In Our Schools program offers sponsored visiting educational music programs for the classroom that serve to build future audiences and inspire young performers. Thursday Musical also partners with the Young Peoples Symphony Concert Association (YPSCA) to bring musicians into the schools to familiarize the students with the music and instruments they will hear prior to attending Minnesota Orchestra concerts. K-2nd grade: Music is For Everybody! The OK Factor's educational outreach is a mix of what inspires them most: exciting string techniques, fun folk tunes, original music, and the stories from their experiences as musicians. They are passionate about creating an experience that will inspire and encourage students and communities to explore music – to cultivate a curiosity about its role in their lives. Their workshops are available for grades K-12. Students learning from the Meadowlark Quartet. 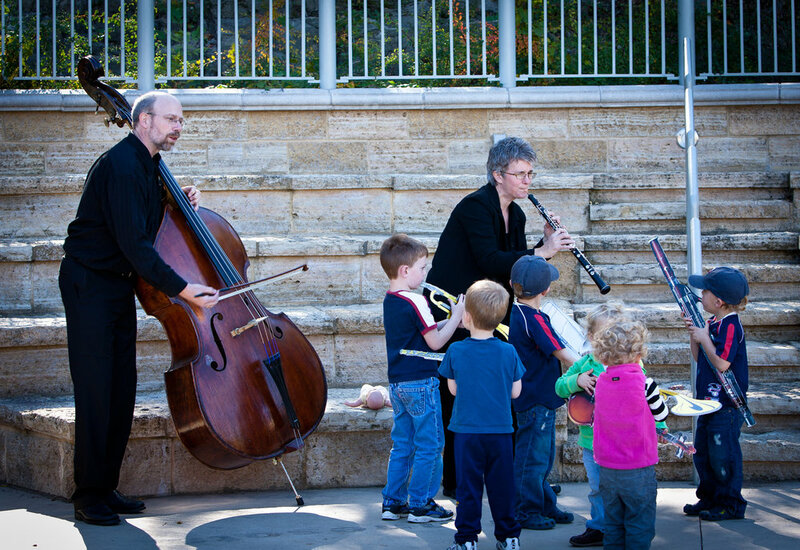 The Meadowlark quartet offers a variety of classroom music education performances. They strive to engage students not only in live performance, but also by creating personal interaction with the music and the quartet members. 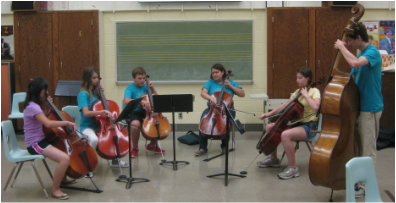 Even if students are not musicians, the string quartet is a wonderful vehicle to illustrate musical conversation and teamwork in order to create a great musical experience. They strive to work with each teacher to shape our presentation to best fit their classroom or program. Program support for Music In Our Schools is provided by The Cy and Paula DeCosse Fund of the Minneapolis Foundation, Harlan Boss Foundation for the Arts, Young People’s Symphony Concert Association and individual donors.